As there is a need for careful analysis in a world where threats are growing more complex and serious, you need the tools to ensure that sensible methods are employed and correlated directly to risk. Counter threats such as terrorism, fraud, natural disasters, and information theft with the Fourth Edition of Risk Analysis and the Security Survey. Broder and Tucker guide you through analysis to implementation to provide you with the know-how to implement rigorous, accurate, and cost-effective security policies and designs. This book builds on the legacy of its predecessors by updating and covering new content. Understand the most fundamental theories surrounding risk control, design, and implementation by reviewing topics such as cost/benefit analysis, crime prediction, response planning, and business impact analysis--all updated to match today's current standards. This book will show you how to develop and maintain current business contingency and disaster recovery plans to ensure your enterprises are able to sustain loss are able to recover, and protect your assets, be it your business, your information, or yourself, from threats. National Police. A former FBI Special Agent and employee for the US State Department, U.S. House of Representatives, Washington D.C. Mr. Broder is considered to be one of the most highly respected security authorities in the United States. 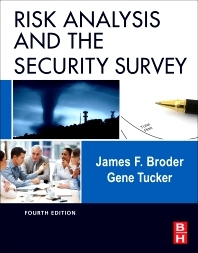 Eugene (Gene) Tucker, CPP, CFE, CBCP, CHST, is co-author of Butterworth Heinemann’s Risk Analysis and the Security Survey, 4th edition. He is qualified as a Certified Continuity Manager (CCM) – ISO 22301 Lead Implementer and as an ISO 22301 Lead Auditor, and has extensive international experience as a corporate manager, investigator, trainer and consultant in security, safety, and business continuity planning.